WASHINGTON – Arizona’s per-pupil spending has fallen 17.5 percent since 2008, the third-deepest rate of K-12 education cuts in the nation, according to a report released Thursday. The Center on Budget and Policy Priorities report said most states saw a drop in per-student spending from the start of the recession to the current fiscal year, but Arizona was one of the few above 15 percent. 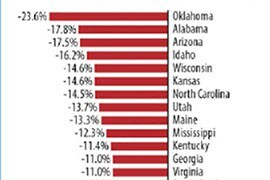 Arizona trailed only Oklahoma, at 23.5 percent, and Alabama’s 17.8 percent drop. Advocates said the impact of the cuts can be seen across the state in larger class sizes, teacher shortages and what one called the “unthinkable” elimination in 2010 of full-day kindergarten. “When you start talking about six years of cuts you can do everything possible to protect the classroom, but then there is nowhere else to cut,” said Janice Palmer, director of governmental relations and public affairs at the Arizona School Boards Association. Help could be on the way, after state courts ruled that the Legislature had not adjusted school aid for inflation under a funding formula that is part of Proposition 301, approved by voters in 2000. As a result of those rulings, a Maricopa County Superior Court judge this summer ordered the state to restore $317 million to schools in this fiscal year and a total of $1.6 billion over five years. Andrew Morrill, president of the Arizona Education Association, said underfunding schools was happening in the state long before the recession. Chris Kotterman, director of governmental relations at the Arizona Department of Education, said the effects of education cuts are felt in districts across the state. “Districts are having to scrape together and find money where they can because the state’s not paying for it,” he said. Palmer said the court ruling was a win for schools, but to make it a complete success lawmakers must appropriate those funds immediately. Morrill agreed that schools in the state cannot afford to wait. “The legislature and those running for office on the public trust should attempt no further delays and should move to fund that court order as fast as they can,” he said. Later this month, the Superior Court will hear arguments on whether the state should be required to provide an additional $1.3 billion in back pay to schools. Palmer said the struggles that Arizona’s schools are facing reflect a state mindset that needs to change. “Education needs to be the top priority of the state. I think other states have prioritized education higher than we have,” Palmer said. A study released today shows budgets cuts from the recession are still hurting students, especially in Arizona. Cronkite News reporter Bethany Reed tells us how schools are dealing with the lack of funding. 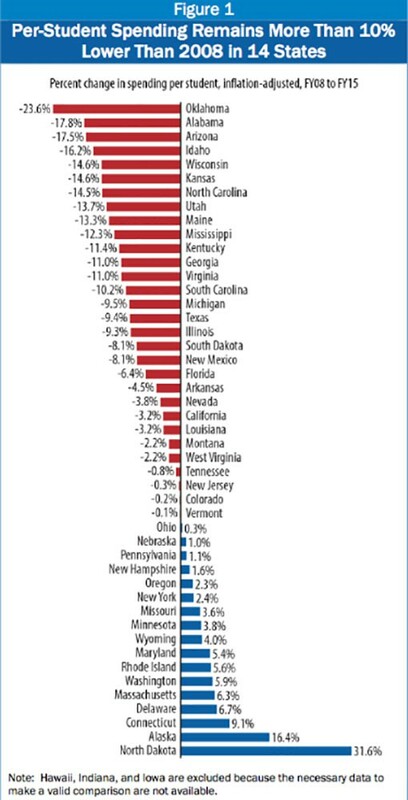 Arizona faced school spending cuts during the recession, like many states, but it has yet to bounce back from those reductions, according to a recent national report, which said the state posted the third-steepest drop in the nation. Advocates say the state cuts to funding for education can be seen in larger classes, fewer teachers and the loss of all-day kindergarten, among other cuts.